This ivory harpoon head comes from the tusk of a walrus, and was made by people of the Punuk Culture, a part of the Thule tradition. It was used for whaling, which is what the Punuk culture is known for. To the Punuk people and its descendants the making of the harpoon and harpoon head was a ceremony in itself. A walrus was only killed for its ivory, and it was as close to a sacred animal as possible to the Punuk people. There were ceremonies to prepare the ivory, after which it was carved very intricately. The carver added his personal mark in order to see which harpooner was the one that had the killing thrust. Figure 2: Whaler Ready to Cast Harpoon. The whales which were hunted by the Punuk people were bowhead whales, and the hunt involved the entire family. They assembled in a boat owned by the family and rode along the shoreline waiting for the whales to surface along the ice . When a whale surfaced, they went in for the kill. Cultural and religious beliefs support the use of every single part of the whale. After it has been processed, it goes out to all members of the family. Many of the indigenous people living within the Arctic Circle practiced whaling, but it was not until the Punuk culture that it became the focus of their society. Some whalebone gravesites show that a particular family could have killed as many as 30 whales in a particular season with a tendency to go for the infant whales. 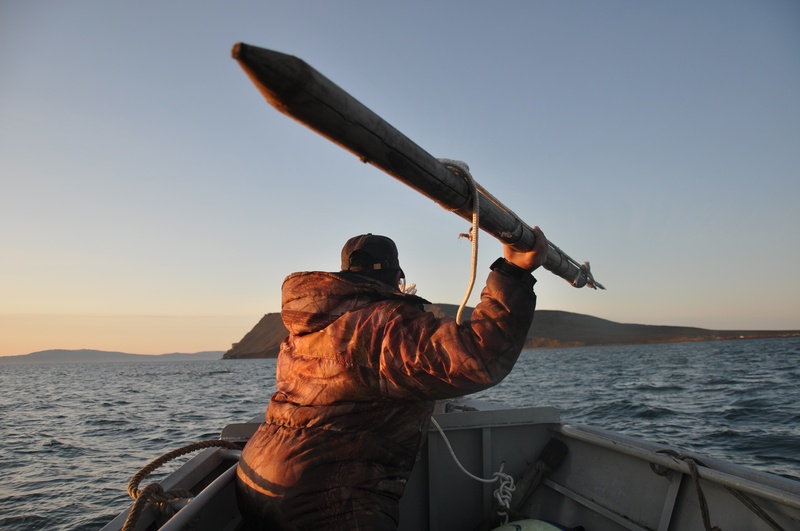 The modern descendants of the Punuk people still practice whaling using methods similar to those of their ancestors. While it may not be the main source of food anymore due to recent whaling laws, it remains an important part of the cultural lives of the indigenous people of the Arctic Circle.Here is an interesting video that show what happens during a whale hunt.